I have enjoyed reading Adele Park’s books for a few years now and I’ve always found them very entertaining and easy to read. I’ve just finished her latest, ‘About Last Night‘, which I loved from start to finish even though it seemed a bit of a departure from some of her earlier books. 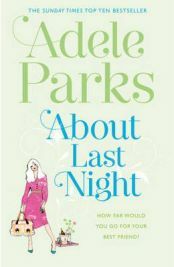 ‘About Last Night‘ tackles the weightier subjects of adultery, betrayal and loyalty, and is a little more sinister at times than what I am used to from this author. ‘About Last Night‘ is about two women, Steph and Pip, now in their late thirties, who have been best friends for almost as long as they both can remember! Their lives are very different though.